During the 12th & 13th century in Europe, this Great Helm was introduced onto the battlefield and worn by knights and other warriors. Historically it is believed to be of Germanic origin, but was widely popular among many regions. The replica is made entirely of forged 18G & 19G carbon steel that is stamped and formed into hand fit shape to fit adult sizes. 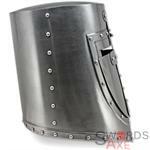 It has true armoring functionality based upon the weapons it would historically defend against. 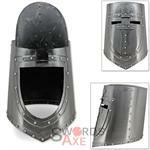 This Great Helm is a little bit more unique since it has a hinged Visor that can open to reveal the face. It makes routine tasks much easier to accomplish whilst wearing the helmet by just flipping up that visor so you can see very clearly. The rotating hook on the visor is meant to connect with your cotton padding arming suit (absorbent padding worn under the armor) with a special strap, not to connect with the helmet itself. To be frank, the visor is supposed to be kept open just partially by about a quarter inch to allow airflow, and the nose might touch the visor if the small visor gap opening is not present (depending on size and fitment). 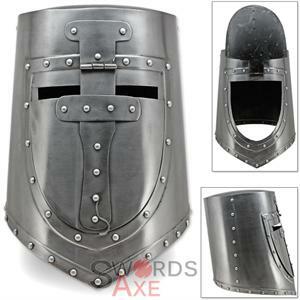 This is a very well made, sturdy helmet for reasonable functional protection based upon historical 13th century weaponry, costume, reenactment, and display. Despite having some rough edges here and there, each handmade helmet is unique and may have slight differences between any two pieces. We recommend you wear a cotton padded coif (head covering) under the helmet for comfort and absorption of kinetic energy, and possibly consider using an adjustable leather suspension depending on fitment.